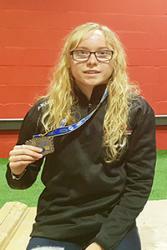 Catrin JonesA Bangor University student brought home a silver medal for Wales from the Commonwealth Weightlifting Championships in Australia recently. Weightlifter Catrin Jones, 18, from Bangor, will commence her studies as a Psychology student this September. Having had a great year on the competitive circuit, Catrin won silver in the junior competition which is for athletes up to 20 years old. A Bangor University Sports Scholarship Local Bursary recipient, Catrin has moved up a body weight class to the 53kg and weighed in as one of the lightest athletes in this class, as her goal is to compete at the Commonwealth games in the 53kg class next year. Over the last 12 months Catrin has had some great results, which include, being placed 8th in the 48kg class in the World Youth Championships, breaking British records in the 48kg class and Welsh Records in the 53kg class.